The 2016 IAPP Conference started with a change of schedule due to weather. On a bright sunny Monday, the group wandered Downtown Charleston for photo opportunities, then toured the Harbor. On Tuesday, classroom presentations were started. 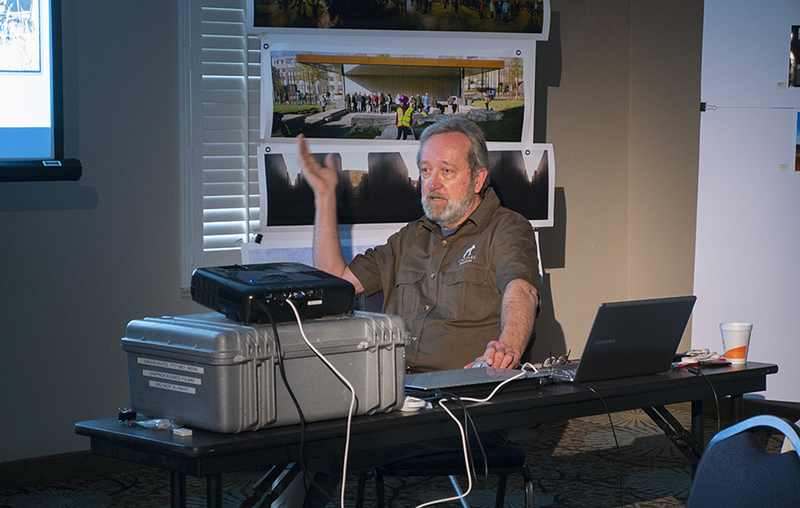 Fran Gardino presented his methods for making the most of stitching errors. Cylindrical stitching, especially of panos taking pointing down around ones feet can produce a fan-shaped composite. One or two tones selected from the image for use as a background gradient allows the image to be printed on rectangular paper. Reposition stitching can create a stepped edge that also can be used for artistic effect. 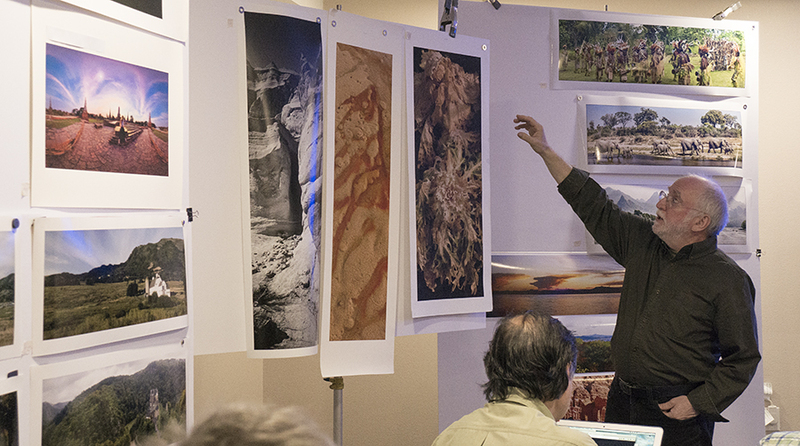 Tom Sheckels presented images from his travels in Africa and China and tips on photographing and stitching moving animal panos. When taking a series of pictures for a pano, take the pictures in the same direction the animals are moving. Try to have stitches in gaps between animals. If the animals are not moving, take a well composed picture of the animals, then take images on both sides to create the panoramic format. For photographing through a hotel or observatin deck window, a lens skirt will eliminate reflections lights and everything behind you. These are available from B&H Photo. 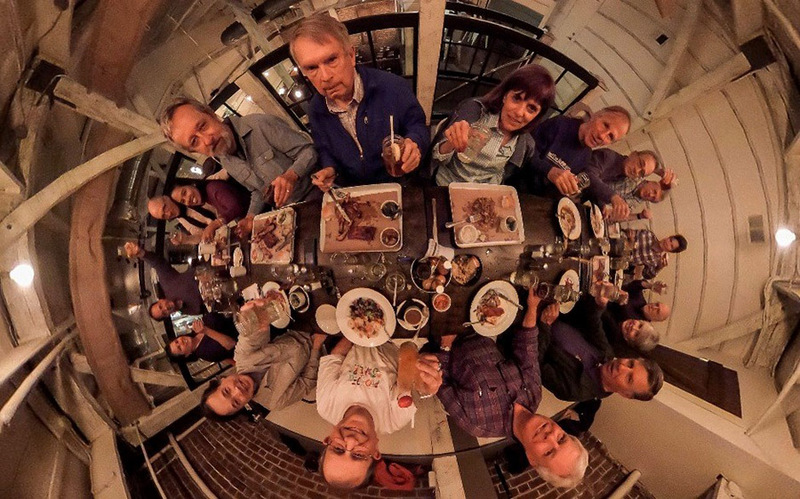 Jook Leung presented his Virtual reality panos of large dinner events in New York City. He demonstrated his monopod with tripod feet that he uses with a very wide angle lens. 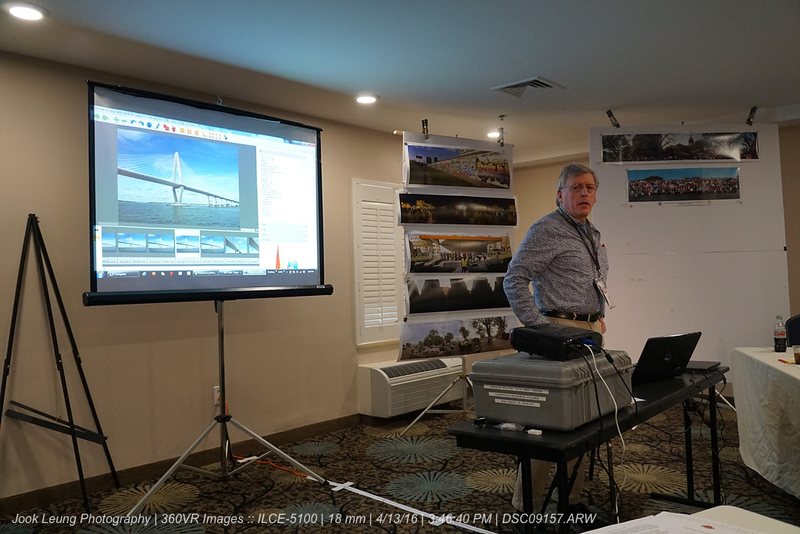 He talked about the challenges of capturing the mood of the event while navigating a dense crowd in a rapidly changing sunset situation. He assembles the visual reality images in PT GUI and uses KR Pano viewer on his web page. 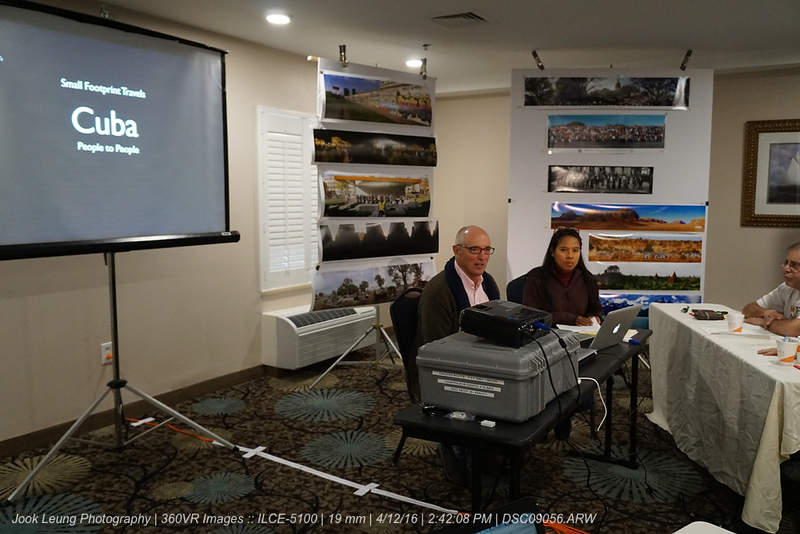 Dave Orbock presented a history of the French village of Peyresq, where the IAPP will be holding a mini-conference July 23-27, 2016. It is a recently restored village with a focus on the arts. The min-conference is being organized with help and support of IAPP member Denis Tremblay and the kind people of Peyresq. Dave also discussed the donation of a Cirkuit camera to the museum in Chalon, France prior to the mini-conference in Peyresq. 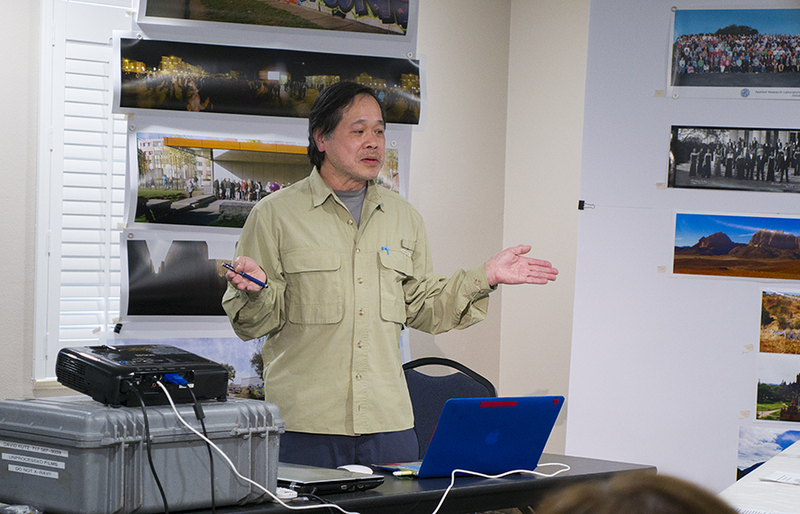 Benjamin Porter presented information about his business, Small Footprint Travels. He and his wife offer comprehensive package tours of Southeast Asia and Latin America, focusing on food and photography. Over the next 12 months they are offering tours of Bolivia, Cuba, Nicaragua, and Vietnam + Angor Wat. 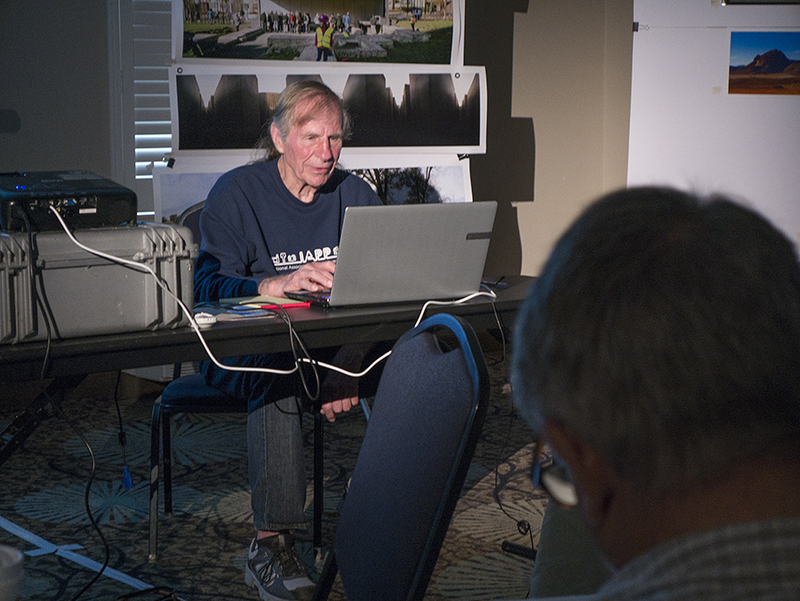 Dan Eldridge presented instructions on creating and editing Wikipedia and Wikimedia pages. He showed the group that IAPP already has a page, but it is not linked to enough categories to be effective. He suggested information to add that would increase awareness of the group. 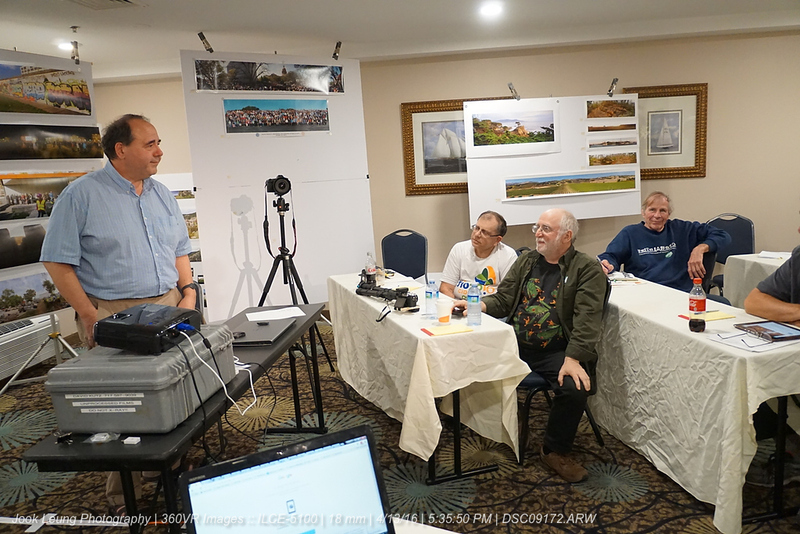 Dave Kutz presented his monopod pole. It raises to nine feet and with a one footed bottom and an indexed collar, he can shoot panos by twisting the pole. He has calibrated the number of clicks per image for each lens that he uses, so that there is sufficient overlap for stitching. 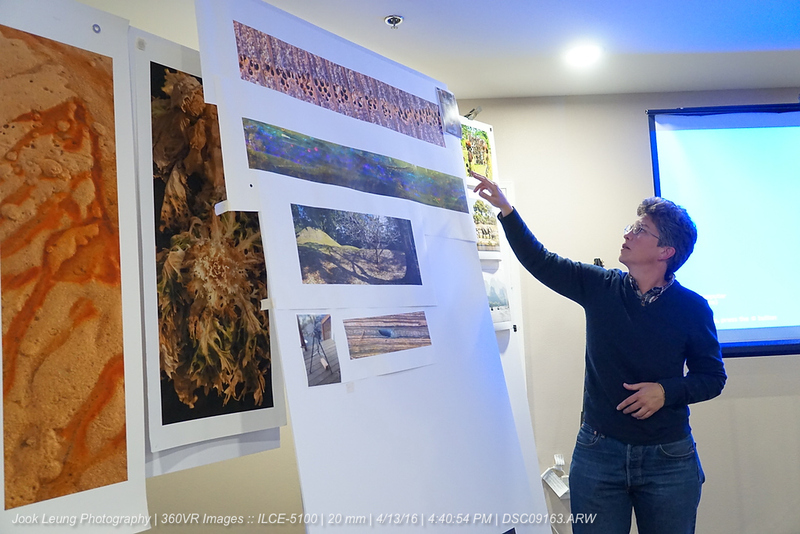 Kay Larkin presented techniques for taking images for stitching using a stereomicroscope and also a macro set-up. The microscope images have a very narrow depth of focus which presents challenges. She is currently using the microscope for panos that are abstractions of ordinary objects. Wednesday morning the group headed out to a rainy welcome at the Magnolia Plantation. The shower was brief and led to nice lighting and many active animals in the adjacent nature preserve. 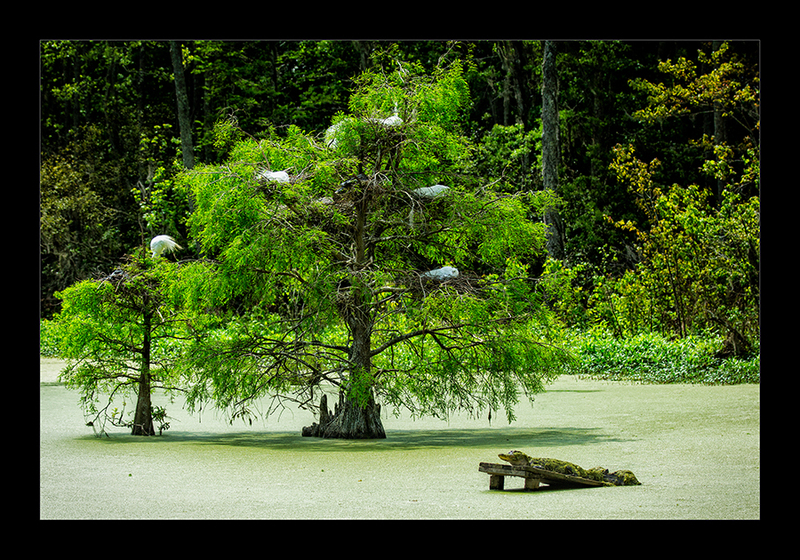 The rookery, where Great Egrets, Snowy Egrets, Great Blue Herons, and Anhingas were nesting was a highlight of the outing. The Banquet was held in Downtown Charleston at Pookums Smokehouse. Many toasts were made and panos taken, and fun was had by all. The business meeting was short as the decision was made to hold the election of Directors and Officers via email the following week. Text provided by Kay Larkin.